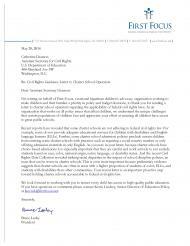 First Focus sent this letter to Catherine Lhamon, Assistant Secretary of Civil Rights at the Department of Education, to thank her for her leadership in sending a dear colleague to charter school operators regarding federal civil rights law. Reports reveal that some charter schools are not adhering to federal civil rights law in their admission policies, services for students with disabilities and English language learners, and school discipline policies. This letter provides information regarding the applicability of federal civil rights laws on charter schools and is an important step toward ensuring that charter schools meet the needs of every student.